"St. Paddy's Day done right: Meat, potatoes, and Ireland's best beer. I tossed some parsley on it at the end b/c I happened to have some. Not necessary." Heat the olive oil in a large pot over medium heat. Stir in the onion, garlic, salt, and pepper. Cook and stir until the onion has softened and turned translucent, about 5 minutes. 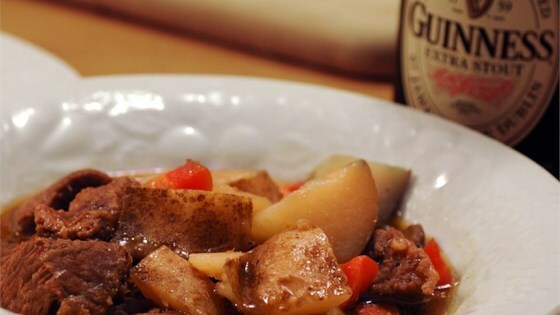 Stir in the beef, beer, sliced potatoes, and quartered potatoes. Bring to a boil over high heat, then reduce heat to medium-low, cover, and simmer until the beef is tender, about 2 hours. Season to taste with salt and pepper before serving. Made the way te recipe is written using carrots and potatoes - yields a very tasty beef stew which I thicken with a little flour and water, if needed. This stew was bitter, thin like soup.